Register to Vote on NVRD at your Library! We've partnered with Non-Profit Vote to bring National Voter Registration Day to over 300 libraries across the country on September 25th. We've partnered with Non-Profit Vote to bring National Voter Registration Day to over 300 libraries across the country on September 25th. We're excited to help hundreds of thousands of Americans register to vote at their library on this historic day. But remember, you can register to vote throughout the year at the library. Just be sure to check your registration deadlines for each election! Click here to find a participating library or other location near you! The problem is that every year millions of Americans find themselves unable to vote because they miss a registration deadline, don’t update their registration, or aren’t sure how to register. National Voter Registration Day wants to make sure everyone has the opportunity to vote. 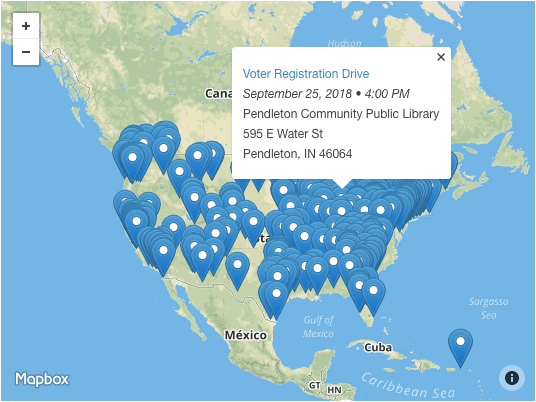 That's why, on Tuesday September 25, 2018, hundreds of libraries and hundreds of other organizations are participating in this single day of coordinated ﬁeld, technology and media efforts to register hundreds of thousands of Americans to vote. National Voter Registration Day seeks to create broad awareness of voter registration opportunities to reach tens of thousands of voters who may not register otherwise. You can help us reach 500 more Americans to encourage them to register to vote at their library by making a $5 contribution today. If you're getting ready to vote for the first time, this short video can help. It goes over the basic requirements for voting in the U.S., and explains why it's important to know your state's specific rules for voting. Federal and state elections in the United States are run by the states themselves, according to Article I and Article II of the Constitution. No two states run their elections exactly the same, so contacting your state or local election office is the best way to find out about your state’s unique election rules. Every state except North Dakota requires you to register to vote. Most states assign you a specific polling place, or voting location. A few states have ballot drop sites instead. Download the National Mail Voter Registration Form. You can fill it out onscreen and print the completed form, or print the blank form and fill it out by hand. Remember to sign the form before mailing it to the location listed for your state. Find guidance for states and territories with different registration procedures.